A few weeks ago I had a wake up call. It came about the time when I was sorting out some clothes and realised that about two thirds of the items in my wardrobe were far too tight for me. Trousers with zips that wouldn’t do up, buttons that wouldn’t do up and with gaping holes on my work shirts. Not to mention several dresses and skirts that made my stomach look like I was 6 months pregnant. My baby is 16 years old! I also saw several unflattering photos of me taken over the summer where I looked like a beached whale. All I can say is at least I wasn’t in a bikini on them. I’m not classed as obese but well within the overweight category. I blame my love of baking but if I don’t bake, I’m not tempted. Trouble is, I love baking and if I don’t do it, I feel I’m missing out. After a couple of attempts at Weightwatchers recently and feeling like I’ve not got anywhere, I decided to try Slimming World. I needed something new and with interesting recipes to motivate me and my family to eat what I cook. So far in the past 3 weeks I have lost 5.5lbs. This, to me who takes ages even to lose a pound was a real motivator for me. Not only that but I’ve really enjoyed going to my local group, everyone is so friendly and warm. Yesterday in group was the launch of Countdown To Christmas and we were asked to bring Syn Free or low Syn Christmas nibbles for a taster session to our group. 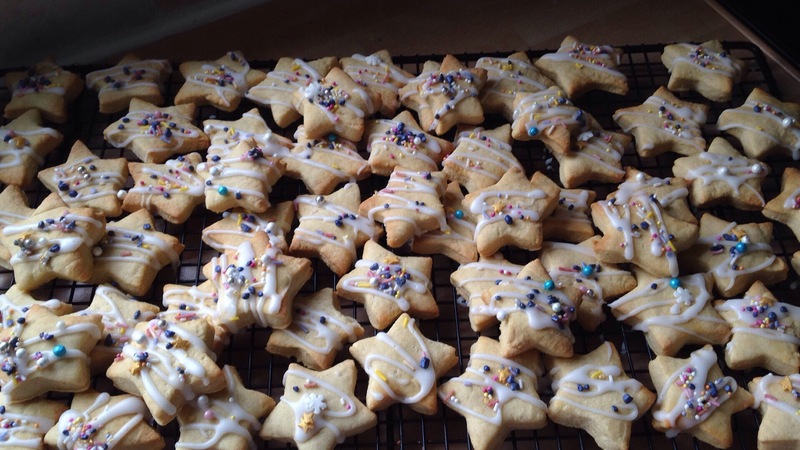 I looked on the Slimming World Website for inspiration and came across some ideas for biscuits including a star shaped almond cookie. I was sceptical about baking cookies from a Slimming World recipe as I can’t stand using artificial sweeteners and low fat spreads in baking. Not only is the taste different, the texture is strange and it’s just not what my baking is all about. 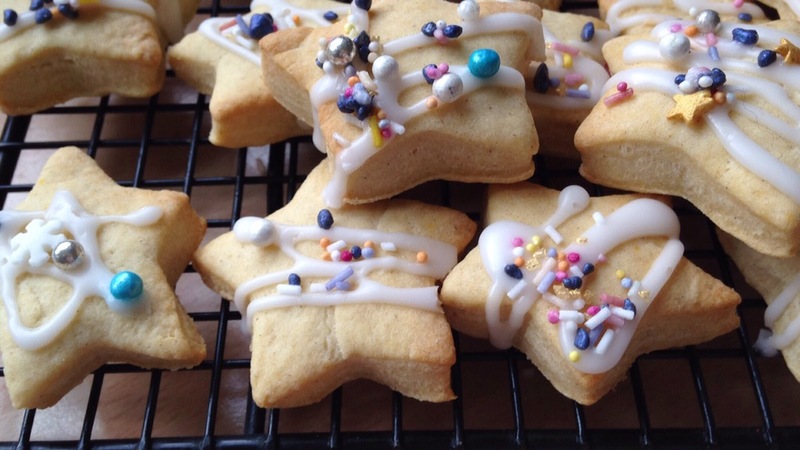 So I tried baking these biscuits with trepidation…eeeeekkk! Yesterday afternoon I was in a rush after getting in from work late. Thankfully there were no distractions so I got all the ingredients out and started on the cookies. I mixed all the flour, baking powder, ground almonds, Canderel, Flora Cuisine and eggs all together to form a smooth dough. The dough felt more like bread dough than a cookie dough and was a bit springy and like elastic. It felt strange. I don’t tend to put raising agents in my roll out cookies, unless it’s gingerbread and I felt as if I couldn’t get the dough thin enough. Also I didn’t want it rising up like pastry or a cake in the oven. As the cookies were meant to be bite size ones I couldn’t use the normal star shape I use for cookies. Instead I used the second smallest one out of a 3D gingerbread tree set, which gave the perfect size for a nibble. The recipe said I could get 48 biscuits, I lost count but there were definitely more than 48 there. I kept a close watch on the oven as the cookies would bake quickly. I gave them about 8-10 minutes at about 160oC in my fan oven. They did expand and rise quite a bit. To decorate, I mixed up a little bit of glace icing. If I hadn’t made them Slimming World friendly I would have spent ages decorating the stars covering the whole of the top with a flood and fill royal icing and lots of glitter and sprinkles. Instead I snipped a tiny hole off the bottom of a disposable piping bag and drizzled the icing on here and there, suppose Mary Berry would have said they were “informal”! I found a few bits left in different sprinkles tubs in my baking stash which needed using up. I chucked them altogether into one big jar, shook it up and sprinkled them on the cookies. Most of the sprinkles went on the floor and not on the cookies though! My son tasted a couple and said they didn’t taste like normal cookies and tasted bland. I tried one and thought they were ok. I took them along to group and they went down well. I think, though for a tiny bite they are still 3 syns. That’s still quite a lot for a little biscuit. Will I bake them again? I’m not sure. I would rather bake biscuits with butter and caster sugar instead of fake sweeteners and low fat spreads full of chemicals.